Two thing went wrong while making this dish. Not wrong like "bad," but just not what I'd planned. That can be both the beauty and the curse of cooking: it often doesn't turn out how you expect, but that's not always a bad thing. As such, it's often best to keep expectations at bay and let the dish go where it will go. In this case, it all turned out fine actually. The first "mishap" was that I forgot what salt cured pork is. I picked up a package of it at Whole Foods thinking it was slab bacon. Then when I opened the package to slice the pork into cubes I instantly realized my mistake. Salt pork looks like bacon, but it has a different flavor. And significantly, it isn't smoked, so that nice smokiness you get from bacon (which I was hoping for here) is missing. The lack of smoke odor was instantly noticeable. The second issue was what happened with the yogurt. In the past, I've made pasta dishes where you add half n half or sour cream at the end to make a nice creamy sauce. I thought I'd try using Greek Yogurt instead. I even did some internet searches that showed people do in fact use yogurt in pasta sauces. Whether it was because I used nonfat yogurt or that I continued to cook it after adding it, I'm not sure, but the yogurt separated and thus added no creaminess to my dish. Instead, there were little tangy crumbles strewn throughout. I was able to address both of these issues though, and in the end, the dish was quite tasty. 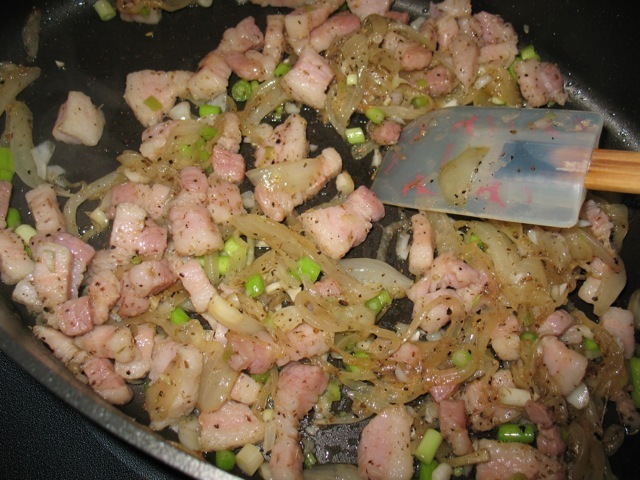 For the salt pork, I improved bacon flavor by adding two teaspoons of liquid hickory smoke flavor. For the yogurt, I added half a cup of reserved pasta water (after the pasta had finished cooking). Neither of the ingredients that didn't work as I planned were a failure: the "smoked" salt cured pork had a nice meaty flavor and the yogurt still gave the dish some added tang. And the half cup of pasta water that I've learned is always good to set aside before draining the pasta ensured the dish wasn't too dry. 1. Bring a large pot of salted water to boil. Cook pasta to package directions for al dente. Reserve 1/2 cup of the water from the cooked pasta. Drain pasta and set aside. 2. Heat a small frying pan over medium-low heat. Toast walnuts until fragrant and lightly browned. 3. Heat a large deep-sided skillet over medium heat (or perhaps a touch below medium). Add olive oil and onions. Cook, stirring frequently about 15 minutes until onions are quite soft but not brown (reduce heat if they start to brown). 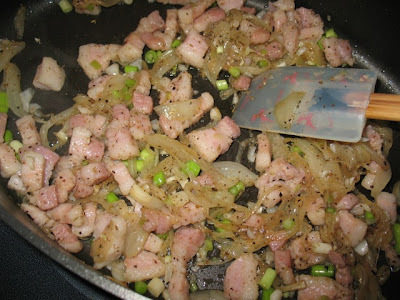 Add pork, green garlic, smoke flavor and pepper and continue cooking until pork has rendered fat and starts to brown around the edges. Season with organo. 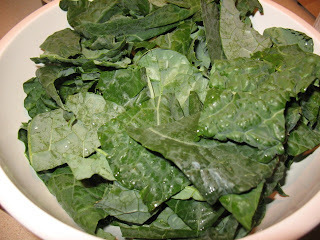 Add kale to pan and cook until wilted, about 5 minutes. Stir in pasta water and yogurt. Remove heat and toss with cooked pasta. 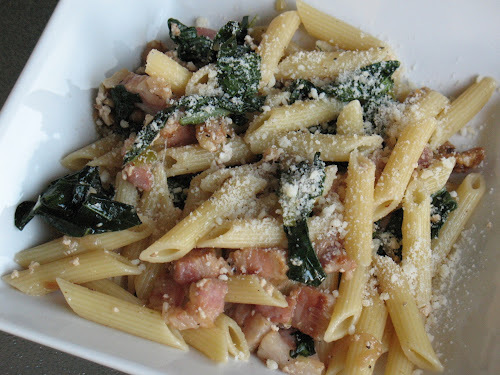 Serve topped with parmigiano-reggiano. This was good. The salt pork was interesting to try, but I think I prefer bacon. Still, you did a nice job with this dish overall!